Americans love Christmas trees. We see them everywhere now that Thanksgiving is over – on cars, in homes, yards, stores, offices and lobbies. One enthusiast in Massachusetts got pulled over by state police for transporting a tree almost big enough to hide his car. Larry Spiekermeier considered his chance to drive a 79′ Montana fir 3500 miles to our nation’s Capitol Building the capstone of his career. We have Christmas tree mania! Why do we love Christmas trees? Should we? They require time, money and work. Some religious purists trace Christmas trees to pagan practices and reject the tradition. Not me. I’m a Christmas tree fan. They light up lives. Let’s face it. The Christmas season can bring tough moments. We pine for lost loved ones. We grieve lost jobs and changed health. Fatigue and extra family togetherness cause simmering problems to surface in painful ways. That happened in Nick’s family. Some years ago, Nick came home from college for the holidays. His sister was divorcing and his parents were upset. Nick’s defense of his older sister led to an intense argument with his father. Harsh words flew both ways. Nick retreated to his room guessing the horrible fight meant he’d have to drop out of college and get a job. 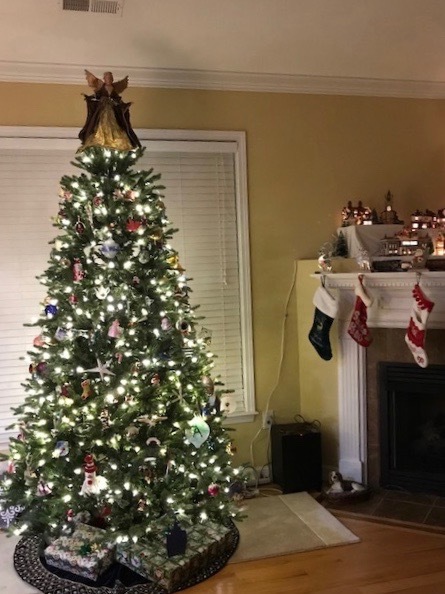 He felt surprised after a few minutes to hear his father knock on his door and say, “Want to go get a Christmas tree?” Nick’s wise father used the Christmas tree tradition to rally family solidarity. 1. Christmas trees turn our eyes toward God. Evergreen trees represent the eternal life offered by Christ. Tree lights symbolize the light of God’s love in a dark world. Presents beneath a tree reflect God’s gift of Jesus. Christmas trees lift spirits by turning our thoughts to the good news of Christmas. 2. Christmas trees affirm hope. Putting up a tree no matter how we feel makes a positive statement. Conflict, grief and depression urge us to skip celebrating Christmas, but refusing to celebrate gives voice (and power) to hopelessness. Acting on the truth we know rather than the pain we feel helps us feel better. 3. Christmas trees delight children who delight us. Little ones don’t understand the deeper meaning of the Christmas tree. They just sense that Christmas is about something good. They marvel at lights and ornaments. Happy children spread cheer. Most of us hold cherished childhood memories of magical Christmas moments. We prize memories of Christmas celebrations with loved ones now gone. Christmas trees and special ornaments conjure up memories that warm our hearts. Like a siren, Christmas trees lure fathers from garages and teens from bedrooms. They encourage guests to linger longer and everyone to put down phones. People love to gather around a Christmas tree. Hot cider and cocoa enhance the effect. Every heart needs a Christmas tree. Christmas trees brighten life. If you don’t celebrate Jesus’ birth, I hope these thoughts help you understand the Christmas tree mania around you. If you’re a tree enthusiast – go forth with a noble sense of purpose. Your work matters. If you’re on the fence about Christmas trees, remember the 5 ways they brighten life. They even help at-risk families and marriages stay together. I hope Christmas trees bring you comfort and joy this season. I’m going to quit typing now and go work on my own tree. Meanwhile, send a picture of your tree to answersinlove@gmail.com by Dec 12. I’ll post a few on my website and enter your name in a drawing to receive a Tree-shaped box of Russell Stover chocolates and a copy of The Empty Chair (helpful reading for you or anyone grieving this season). Enjoyed the creative insights into this holiday tradition. You obviously did your “tree-search”! Smiling, Donna! See you at Stones party! Can’t wait.